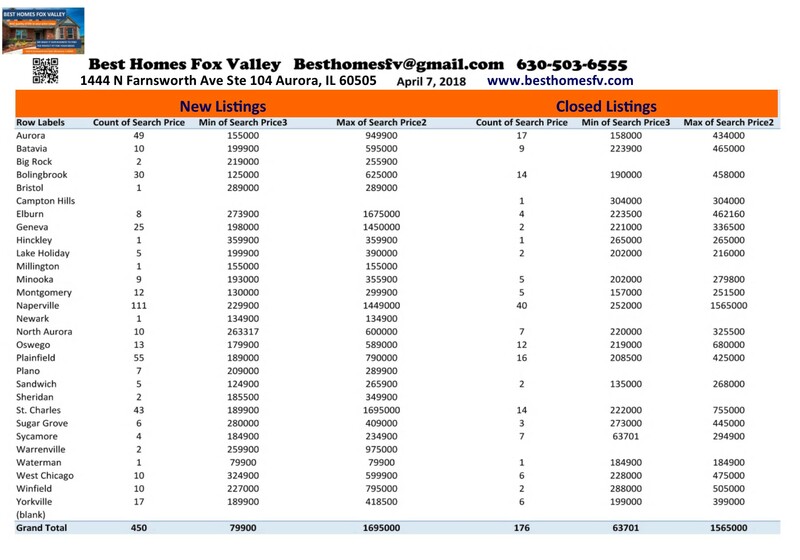 Market Update Fox Valley-April 7 2018. Wow! 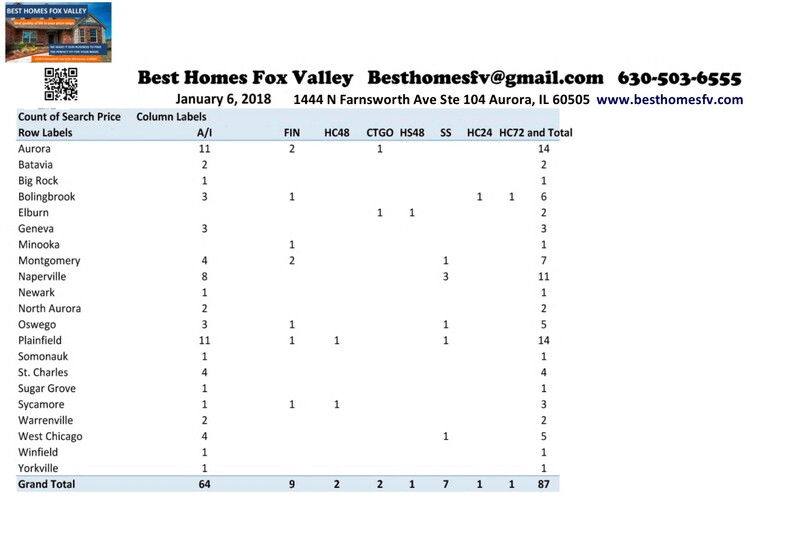 New listings of single family homes almost doubled this week in the Fox Valley area. 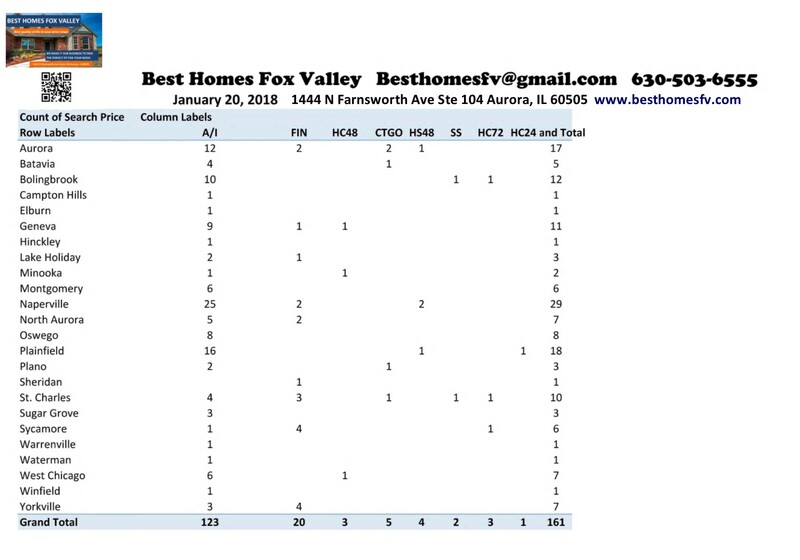 450 new listings this week compared to 227 last week. Come on buyers now is the time for choices before they are gone! Closings this week didn’t drop off that much for the 1st week in April. 176 closings this week in the Fox Valley area compared to 221 last week. If 2018 is the year that you would like to sell this is the best time of the year right now to sell. Contracts accepted by sellers this week were down slightly this week. 279 this week compared to 321 last week. It was a holiday week that had slower activity with new listings so that is not too bad. Short sale contracts that sellers accepted this week were about the same. 6 this week compared to 7 last week. Now they will be submitted to the lender to see if they will also accept contract as written. Sellers accepted contracts this week that are contingent on the close of the buyers current home. Buyers have accepted a contract on their current home but need to close to purchase. 10 with a kick-out clause of 72 hours, 13 with 48 hours and 6 with 24 hours. Contracts were also accepted this week that are contingent on the sale and closing of the buyers current home. Buyers current home might or might now already be on the market. They still need to sell and accept a contract on their home and close before they can purchase. 1 with a kick-out clause of 72 hours, 2 with 48 hours and 4 with 24 hours. If you are thinking about selling your home the first-step is to have a market analysis to see what the value is in the current market. Tell you what you need to do to get your home market ready. We can explain the costs of selling your home and an estimate of what you will receive at closing. We will update this when a contract comes in and we know all the terms of the contract. If you are thinking about purchasing a home or town home your first-step is to get pre-approved with a loan officer to see what you qualify for and see if you need to work on your credit score so you get the best interest rate. We will need the letter the loan officer gives you to go with an offer when you find the home you like. It can be no more than 30 days old. You might want to get familiar with the different types of loans and the process before you begin. Take a look at current interest rates. School ratings are important whether you have kids or not. Always be thinking about resale. Look at Down Payment Resource to see if you qualify for any assistance. It might save you money so you can do some things to your home once you move in like paint or make some improvements. Call us with any questions you have or to get started. 630-503-6555 Jeffery Szymczak-Broker ext 104, Bobby Burson-Broker ext 105 or Kristine Heiman-Managing Broker ext 101. Our goal is to negotiate price and terms that are best. We make it our business to find the perfect fit for your needs. Have a great week! Market update Fox Valley-April 7 2018. 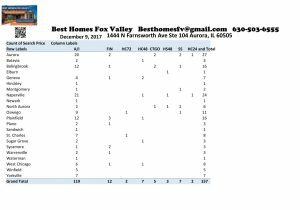 Best Homes Fox Valley-Find your home today! Market update Fox Valley-March 24 2018. 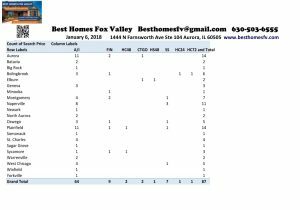 Fox Valley market is consistent with last week. New listing this week 324 compared to 325 last week. The market is getting more dependable as we continue through Spring Market. Closings were also consistent with last week. This week there were 182 closed single family homes and last week there were 187. Next week is the last week of the month so we should see an increase in closings. Contracts accepted this week were slightly less than last week. 307 this week compared to 321 last week. Some offers are taking a little longer with multiple offer situations. Short sales accepted this week were slightly lower. 6 this week compared to 9 the week before. Now they will be submitted to the lender to see if they will also accept contract as written. Sellers accepted contracts that are contingent on the buyers current home closing before purchasing. Buyers current home has a contract accepted but needs to close. 12 with a kick-out clause of 72 hours, 9 with 48 hours and 2 with 24 hours. Contracts were also accepted by sellers that are contingent on the buyers home selling and closing before purchasing. Buyers current home might or might not already be on the market. 4 contracts were accepted with a kick-out clause with 48 hours. Spring Market is in full swing. This is the best time of the year to sell your home with the most buyers actively looking. Getting a market valuation is the first step to see what your home is worth in the current market. Getting your home market ready is the next step. You want it to look fresh and appealing inside and out. Give us a call at 630-503-6555 Jeffery Szymczak-Broker ext 104, Bobby Burson-Broker ext 105 or Kristine Heiman-Managing Broker est 101. Our goal is to negotiate the price and terms that are best. We make it our business to find the perfect fit for your needs. If you are looking to purchase your first step is to get pre-approved to find out what you qualify for. A loan officer will provide you with a letter that will need to go with an offer when you find a home. Down payment resource is a place to go to see if any help is available. Look at current interest rates that we hear might continue to rise throughout the year. The interest rate you receive will depend on your credit score. Learn more about loans and the process. 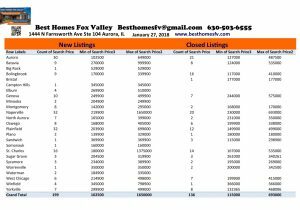 Market Update Fox Valley January 272018. 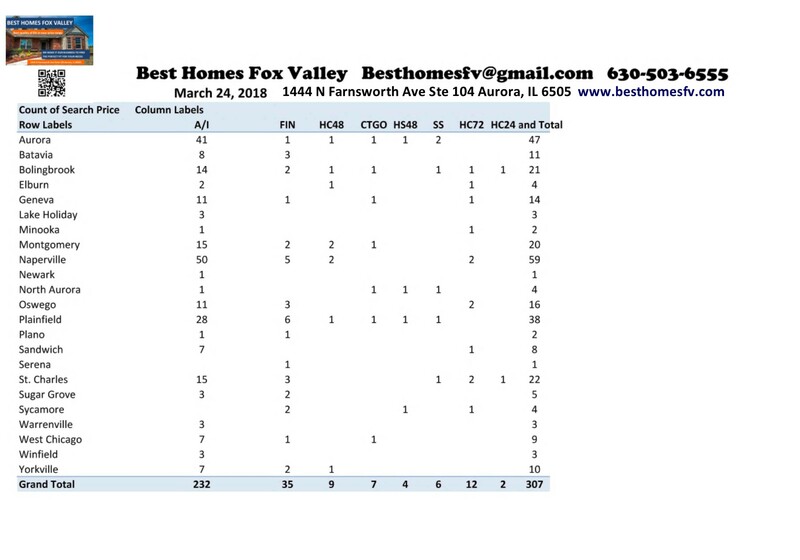 There were 199 New listings of single family homes this week in the Fox Valley. 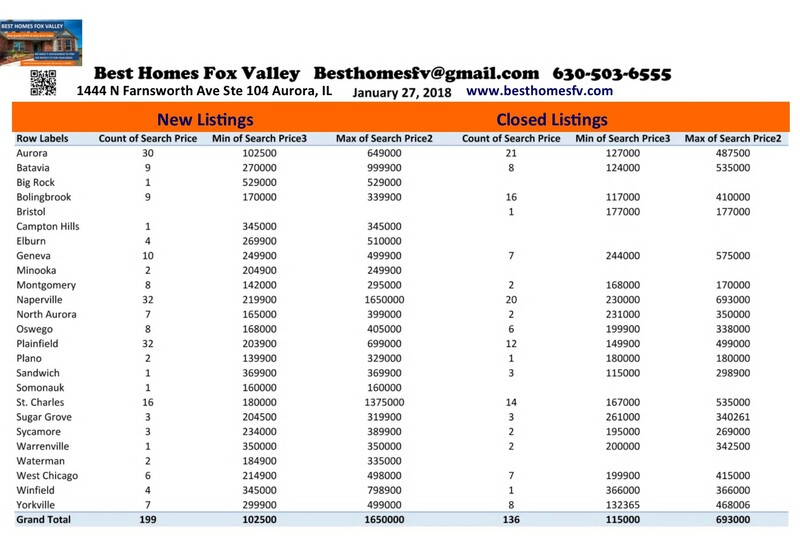 That is slightly down from last week that was 221 New Listings. Now is a great time to have your home on the market. Buyers are actively looking for homes. Getting your home listed now before Spring market is smart so you have less competition. Request a home valuation to see where you are at with value in today’s market. Closings were up this week. There were 136 closing this week compared to 113 last week. The end of the month is when most people want to close. Buyers getting a loan bring less to the closing table for interest the closer to the end of the month. It is figures daily. Sellers accepted contracts in these communities this week. Sellers accepting contracts this week were up. 187 this week compared to 161 last week. This number would go up if there were more homes on the market. Homes that are market ready and priced right are going under contract right away. Buyers have to act quickly or they will miss out. It is so important that you do not over price your home. Buyers need to be ready before they start looking at homes. You need to get pre-qualified with a loan officer and have an approval letter to go with a contract. In this fast moving market you need to be ready. Waiting to get the pre-approval or get it updated you might miss out on a home. Approval letter should be updated every 30 days. In this market with low inventory it might take you a while to find the right home. Short Sales accepted by sellers this week were up slightly. 6 this week compared to 2 last week. They will now be submitted to the lender to see if they will also accept contract as written. Sellers accepted contracts that are contingent on the close of the buyers current home. 4 with a kick-out clause of 72 hours, 2 with 48 hours and also 2 with 24 hours. Buyers already have accepted a contract on their current home but need to close before purchasing. Contracts were also accepted by sellers that are contingent on the sale and close of the buyers current home. They might or might not already have their current home on the market. Buyers have not accepted a contract on their current home. They need to still sell their home and close before purchasing. 2 with a kick-out clause of 72 hours, 1 with 48 hours and 2 with 24 hours. We are keeping an eye on the market. Looking for attached housing? Let us know and we can update you on that market. Call us at 630-503-6555 Jeffery Szymczak-Broker ext 104, Bobby Burson-Broker ext 105 or Kristine Heiman-Managing Broker ext 101. Fill out the contact form if you would like us to get back to you. Let us know the best way and time to get back to you. Search for homes anytime. Need recommendations for loan officers to get in contact with let us know. We would be happy to give you a few to contact that we have successfully worked with. Wondering what interest rates are right now here is one source to check. Down payment resource is another place you might want to check. Information about loans and the process is here. We make it our business to find the perfect fit for your needs. Our goal is to negotiate price and terms that are best. 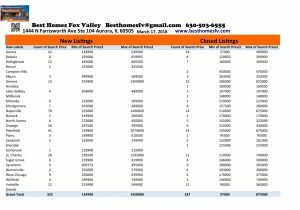 Market update Fox Valley January 27 2018. 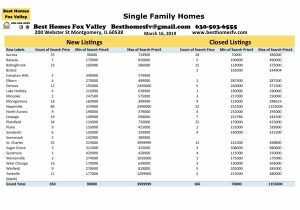 Market Update Fox Valley January 20 2018. 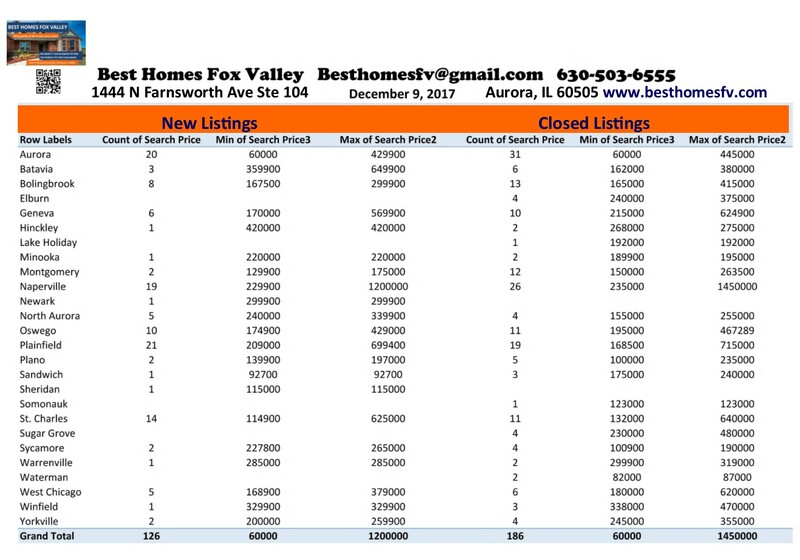 New listings in the Fox Valley were pretty consistent with the week before. 221 New this week compared to 224 the week before. That is a good sign. We love consistency! Hopefully we will steadily improve going into the Spring market. Over 300 listings is what we are looking for so buyers have choices of homes. 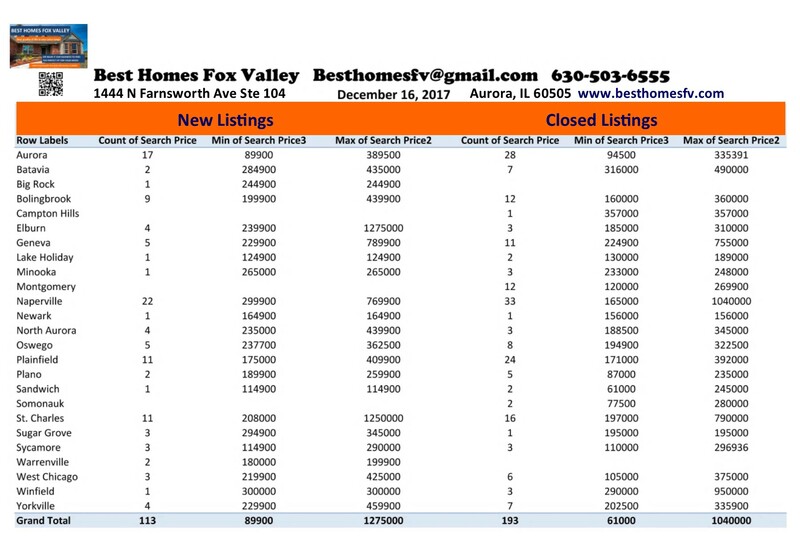 Closed listings we down this week. 113 this week compared to 235 the week before. The next week and a half these numbers should improve as we head into the end of the month when most buyers and sellers like to close. Contracts accepted by sellers this week were not far off the week before. 162 this week compared to 171 the week before. The weather and time of year have not kept the buyers away. They are still actively looking for a home to purchase. Now is the time to get your home on the market before the Spring market hits and you have more competition. We can provide you with a home valuation to let you know what your home is worth in today’s market. Let you know what you need to do to get your home market ready. Short sales accepted by sellers this week were down. 2 this week compared to 11 last week. Now they will be submitted to the lender to see if they will also accept the contract as written. Sellers accepted contracts that are contingent on the buyer closing on their current home. The buyers have already accepted a contract on their home but need to close to purchase. 3 with a kick-out clause of 72 hours, 3 with 48 hours and 1 with 24 hours. Contracts were also accepted by sellers this week that are contingent on the sale and closing of the buyers current home. The buyers home might or might not already be on the market. They still need to accept a contract on their home and close before purchasing. Only 4 this week that have a kick-out clause of 48 hours. We always advise you to talk to your real estate attorney when buying or selling a home. We can recommend attorney’s if you do not have one already. Contact us to answer your real estate questions and to get you started whether buying or selling your home. You can call us at 630-503-6555 or fill out the contact form if you would like us to get back to you. Just let us know how and when a good time would be. Jeffery Szymczak-Broker ext 104, Bobby Burson-Broker ext 105 or Kristine Heiman-Managing Broker ext 101. Start searching for homes anytime. If you want to purchase a home you will need to get pre-qualified with a lender first. We can make recommendations if you do not know who to contact. They will provide you with a letter stating what you qualify for and what type of loan that will need to go with an offer when you do find a home. If you are purchasing with cash you will need to provide a proof of funds letter from your bank to go with an offer. Look at school ratings, current interest rates, down payment resources or information about the different types of loans and the process. You can also go to a community website to see what they have to offer if you are not familiar with the community. Sign up for email alerts if you want to receive listings as they hit the market. We make it our business to find the perfect fit for your needs. Our goal is to negotiate the price and terms that are best. Have a great week! Market update January 6 2018. Happy New Year! This is the first market update for 2018. Now that the holidays are over the market is starting to get back to normal. If only the temperatures would get back to normal that would be great! We are supposed to get into the 30’s and 40′ next week. I am really looking forward to that. This first week of 2018 new listings were 164 compared to 62 the last week of 2017. When that number gets to 300 or more a week I will be a little bit happier and I know the buyers will be happier as well. Closings in this first week were down. 107 this week compared to 137 that last week of December. These numbers should improve as we get closer to the end of the month. With the increase in listings it will help but a lot of them will be reflected in February numbers for closings. Market update January 6 2018-accepted contracts from sellers in these communities was up a little from the last week in December of 2017. 87 this week compared to 78 the week before. This number should go up next week with the increase of New listings if they are priced correctly. Even in subzero temperatures buyers are out there looking at everything that hits the market if it is priced right and market ready. Sellers there is no need to wait for Spring market the buyers are still out looking. Right now you will have less competition. Short sales this week that were accepted by sellers were up slightly. 7 this week compared to 4 the week before. Now they will be submitted to the lender to see if they will also accept the contract as written. Contingencies are a part of a contract if the terms are waiting for something to happen like home inspection, attorney review, or if the buyer is getting financing. If the buyer for your home already has a home they might ask for a contingency on the sale & closing or just the closing on their current home. This week buyers asked the sellers for a contingency on the close of their home. They already have a contract on their home but need to close before purchasing. 1 with a 72 hour kick-out clause, 2 with 48 hours and 1 with 24 hour kick-out clause. The sellers accepted these terms. Buyers also asked the sellers for a contingency on the sale and close of their current home. They might or might not already have their current home on the market. Buyers do not have an accepted contract on their home. They still need to sell their home. This week only 1 seller accepted these terms with a 48 hour kick-out clause. 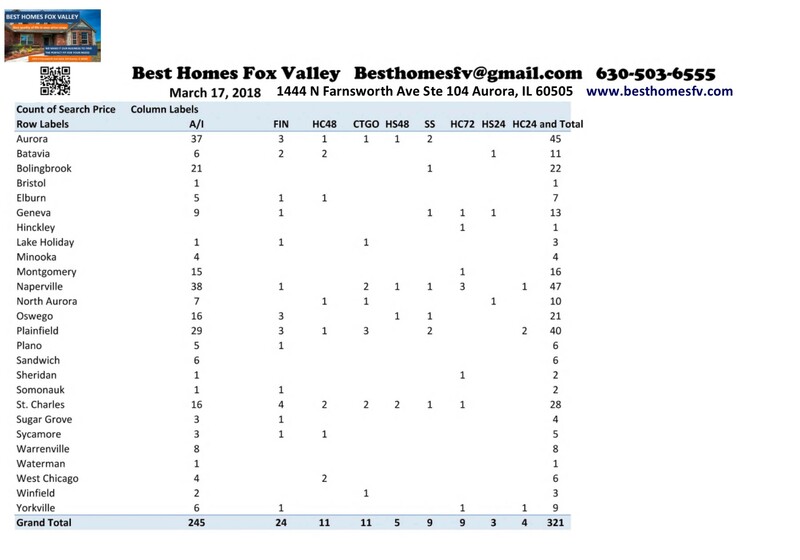 The other communities that sellers accepted a contract that was a short sale were Montgomery with 1, Oswego with 1 and West Chicago also with 1. If you are thinking about selling your home this is a great time to be a seller! Request a home valuation and we will let you know the value of your home in the current market and what you need to do to get your home market ready. If you are looking to buy a home. Your first step is to talk to a loan officer to see what you qualify for and if you need to do anything to bring up your credit score to get the best interest rate. We can give you recommendations of a few loan officers to contact. They will give you a letter showing what you qualify for. We need that to start showing you homes and it will go with the contract when you do find the right home and want to submit an offer. Call us at 630-503-6555 Jeffery Szymczak-Broker ext 104, Bobby Burson-Broker ext 105 or Kristine Heiman-Managing Broker ext 101. You can also fill out our contact form if you would like us to get back to you. Let us know when would be the best time. We make it our business to find the perfect fit for your needs. Our goal is to negotiate the price and terms that are best. Market update January 6 2018 Have a great week! 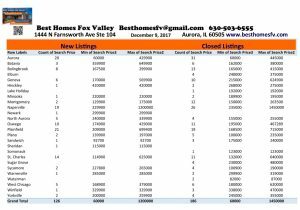 Market update Fox Valley December 16 2017. New listings are down again this week. 113 this week compared to 126 the week before. I think sellers are waiting until after the holiday at this point. This is not good for buyers that are hoping to find a home and be excited during the holiday that they finally found a home. Closed homes were up slightly this week. 193 this week compared to 186 the week before. Closings should increase as we head to the end of the month and end of the year. It sometimes gets tricky to set up closings with 2 holidays so close to each other. Closings at this time of year are extra special with everyone in the holiday spirit. 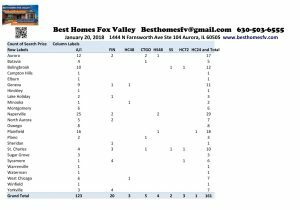 If you are looking for a home these are the communities with the most New Listings. 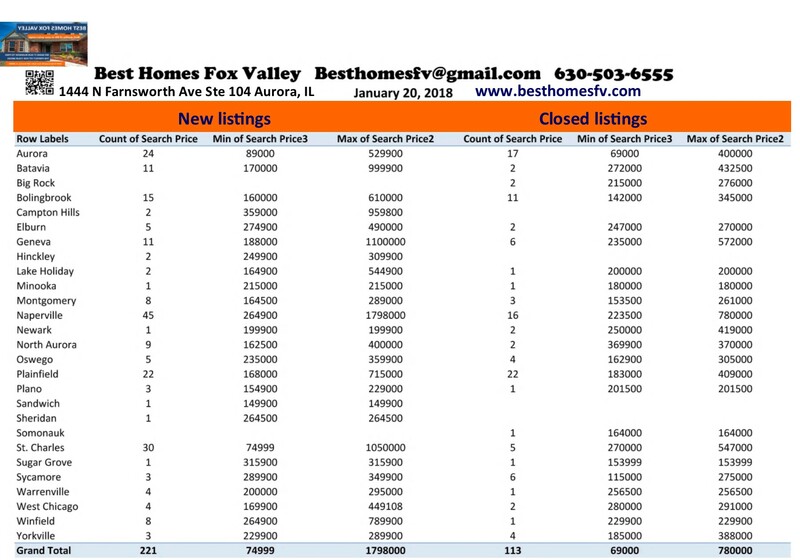 The chart above shows you the price ranges in each community of New Listings and Closed homes. You might want to take a look at their community website to see what they have to offer. Contracts accepted by sellers was up this week. 172 this week compared to 157 the week before. Buyers are still actively looking for homes. It is a great time to be a seller with low inventory and not a lot of competition. Short sales accepted by sellers this week were about the same. 8 this week compared to 7 the week before. Now they will be submitted to the lender to see if they will also accept the contract as written. So many people think the price that a short sale is listed at is what the lender agreed to list it for. That is not true unless they have had an offer already that did not go through. Other communities that sellers accepted a contract that was a short sale are North Aurora with 1, Plano with 1 & West Chicago also with 1. Even though we are close to the holidays the buyers are still out there looking. Contracts were accepted this week that are contingent on the close of the buyers current home. The buyers have already accepted a contract on their current home but need to close before purchasing. 3 with a kick-out clause of 72 hours and 5 with a 48 hour kick-out clause. Sellers also accepted contracts that are contingent on the sale and closing of the buyers current home. The buyers current home might or might not already be on the market. They still need to accept a contract on their current home and close before purchasing. 1 with a 72 hour kick-out clause, 2 with 48 hours and 1 with a 24 hour kick-out clause. We are keeping an eye on the market. Let us know what questions you have on selling or purchasing a home. Our goal is to negotiate the price and terms that are best. Buyers can learn more about loans and the process here. If you need recommendations of a loan officer to contact we can tell you about loan officers that we have successfully worked with for you to choose. Your first step is to get pre-qualified so you know what you are able to do. You can look at current interest rates and keep an eye on them. Look for down payment resources. Homeowners if you are thinking about selling, you can request a home valuation to see what your home is worth in the current market and what the projected outcome might be. We tell you what you need to do to get your home market ready. Call us at 630-503-6555 Jeffery Szymczak-Broker ext 104, Bobby Burson-Broker ext 105 or Kristine Heiman-Managing Broker ext 101. You can also fill out the contact form is you prefer us to get back to you. Start searching for a home anytime that is convenient for you. You can also look to keep track on how your area is selling. Market update Fox Valley December 16 2017. 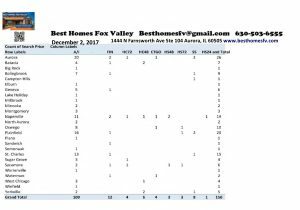 Market update Fox Valley December 9 2017. It was a busy weekend so I am just now getting the time to post this from Saturday. New listings were way down this week. 126 this week compared to 177 last week. Potential sellers might be waiting until after the Holiday to list their home. If they listed now they just might make someone have a wonderful holiday knowing they have found a home, Buyers are still out looking especially with our continued low inventory. Closed homes this week were also down slightly. 186 this week compared to 205 last week. Usually the beginning of the month the numbers are lower. I think last week was homes that could not close at the end of November because of the Thanksgiving holiday. These numbers should pick up as we get closer to the end of the month and also end of the year. 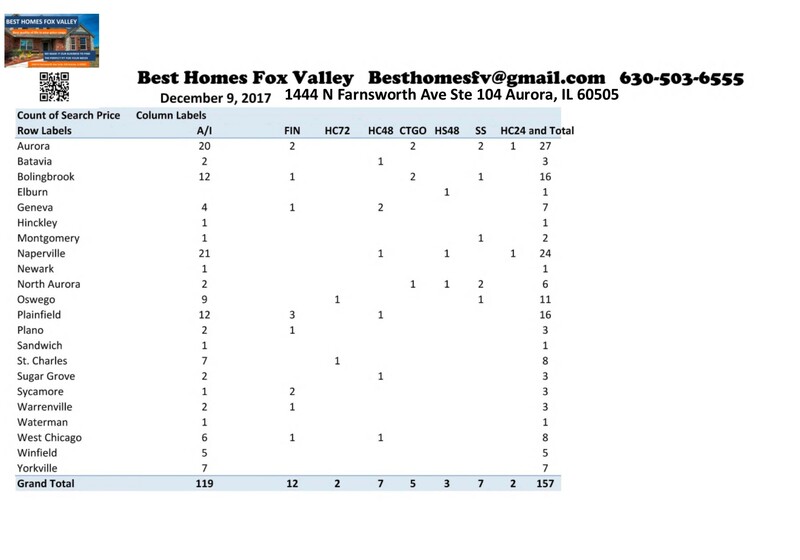 The chart above shows you in each community the single family homes that were listed and closed and the price ranges. 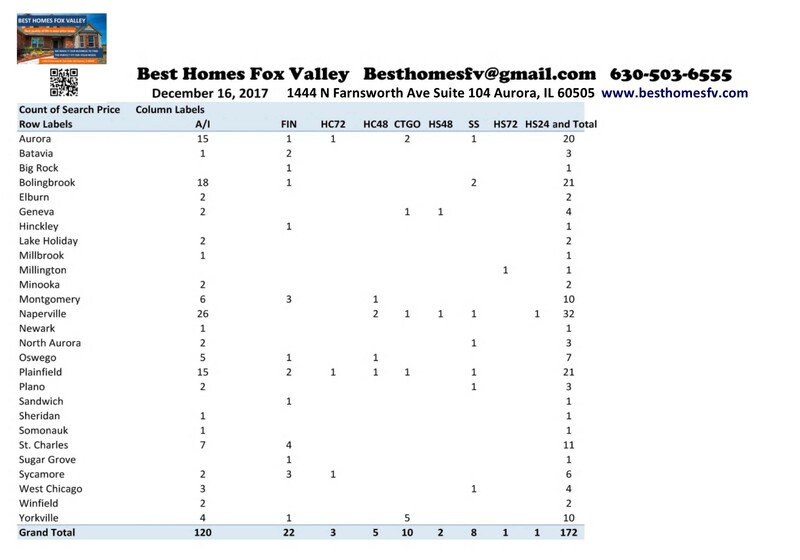 Contracts this week that were accepted by sellers in the Fox Valley were about the same as the week before. 157 this week compared to 150 last week. These numbers would improve with more homes on the market. Buyers are out looking and waiting for homes to see. Short sales this week were also about the same. 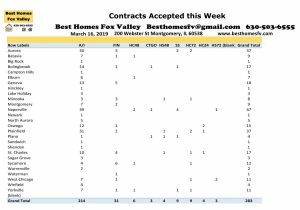 7 contracts accepted by sellers this last week compared to 8 the week before. Now the contract will be presented to the mortgage company to see if they will also accept contract as written. The wait begins! The other communities that the seller accepted a contract and was a short sale were Montgomery with 1 and North Aurora with 2. Sellers accepted contracts that the contract is contingent on the close of the buyers current home. They have already accepted a contract on their home but need to close to purchase. 2 with a 72 hour kick-out clause, 7 with 48 hours and 2 with a 24 hour kick-out clause. Contracts were also accepted by sellers the are contingent on the buyer selling their home. They might or might not already have their home on the market. They need to sell their home and close before purchasing. 3 with a kick-out clause of 48 hours. The chart above shows you the communities that had sellers accepting contracts for last week. Despite low inventory buyers are still out there looking wanting to purchase. Contact us so we can negotiate your home sale or purchase with price and terms that are best. We make it our business to find the perfect fit for your needs. You can call us at 630-503-6555 Jeffery Szymczak-Broker ext 104, Bobby Burson-Broker ext 105 or Kristine Heiman-Managing Broker ext 101. You can also fill out the contact form if you would like us to get back to you. 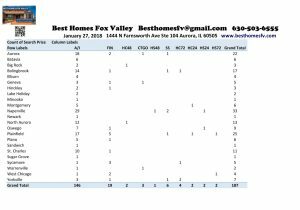 If you are thinking about selling you can also fill out the home valuation request and we can set up a time that works best for you. We will provide you with the value of your home in the current market. If you are thinking about purchasing, your first step is talking to a loan officer to see what you qualify for and see if you need to work on your credit score before purchasing. You might want to check out more information about loans and the current interest rates. You might also want to check out down payment resource to see if there is any help for you. 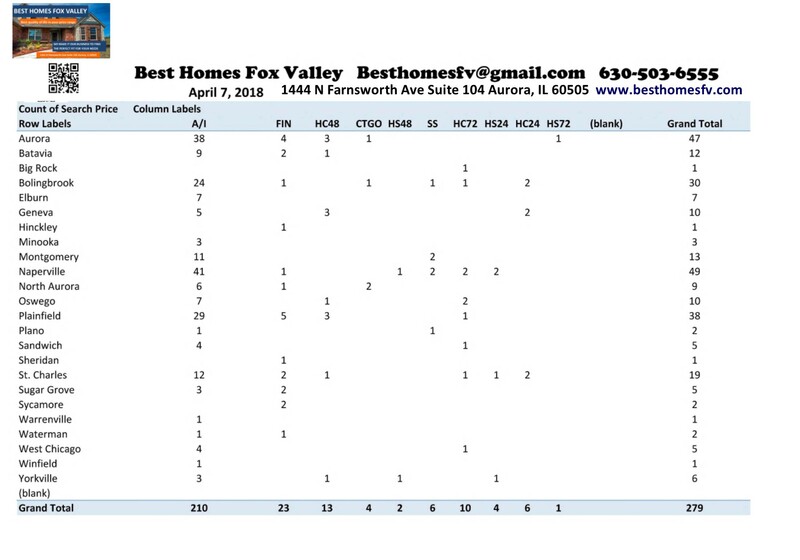 Search for homes anytime in Northern Illinois. 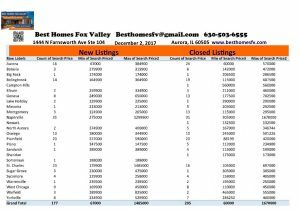 Market Update Fox Valley December 2 2017. We are back up to the activity before the Thanksgiving Holiday. 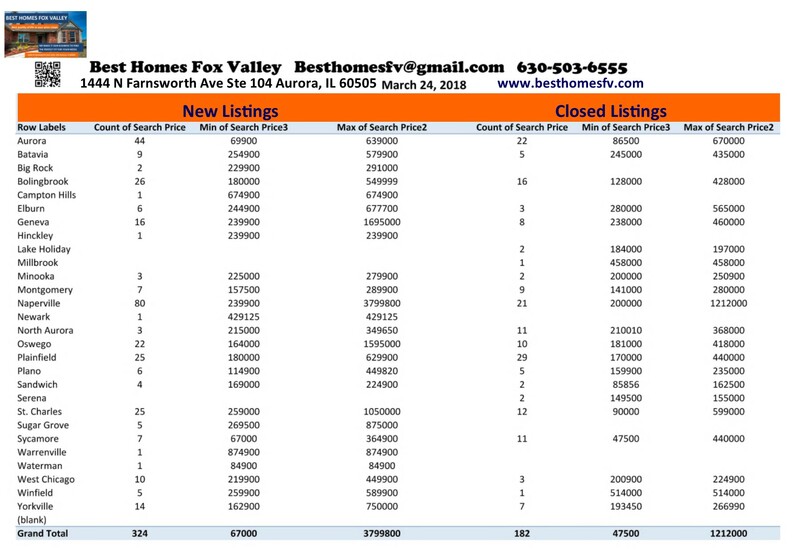 This week there were 177 New Listings compared to 104 last week. Buyers have more to look at which is a good thing. We are still extremely low with inventory so it can be very frustrating to be able to buy and not find what you are looking for. Sellers it is still a great time to sell! Closings were back up to the levels before the holiday even though it is the beginning of the month. 205 Closings this week compared to 130 last week. Usually the beginning of the month is slower and picks up toward the end of the month. Contracts accepted by sellers this week were up. 150 this week compared to 134 last week. We were at 199 the week before the holiday. 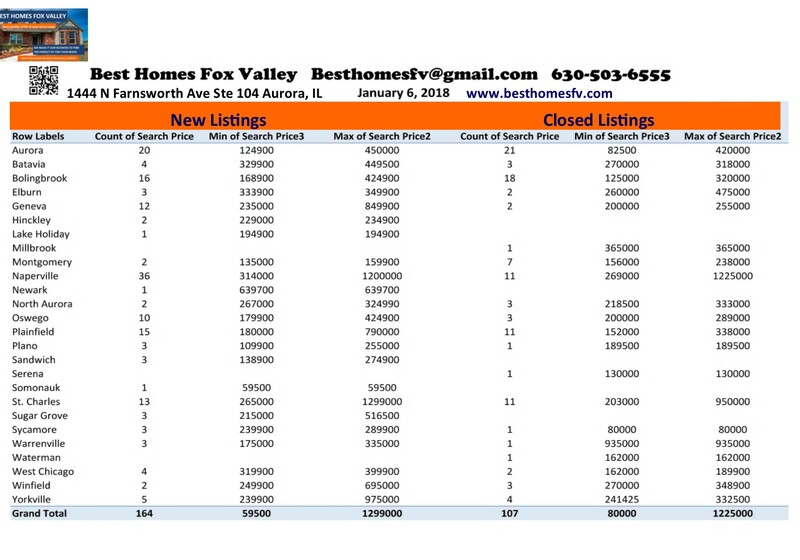 Hopefully with more listings this week will help bring the numbers back up. Short sales are staying low. Sellers accepted 8 contracts this week. There were 5 last week. Now they will go to the mortgage company to see if they will also accept the contract as written. Sellers accepted contracts this week that are contingent on the buyer closing on their home. The buyers have already accepted a contract on their home but need to close to purchase. 4 with a kick-out clause of 72 hours and 6 with a 48 hour kick-out clause. Contingent contracts were also accepted from sellers this week that the buyer needs to sell their home. They might or might not already have their home on the market. They need to sell their home and close before they can purchase. 3 with a 72 hour kick-out clause, 3 with 48 hours and 1 with a 24 hour kick-out clause. This information can be important to you if you are from out of the area, thinking about selling or buying. If you are from out of the area in most cases the areas with the most activity usually mean that the schools might be better than other areas. Jobs or good access to roads to get to jobs. Community activities or entertainment is good there. It can also be important if you are thinking about selling. You can see how your community is doing with activity. If your community has less sales it might take a little longer to sell than an area that has more activity. 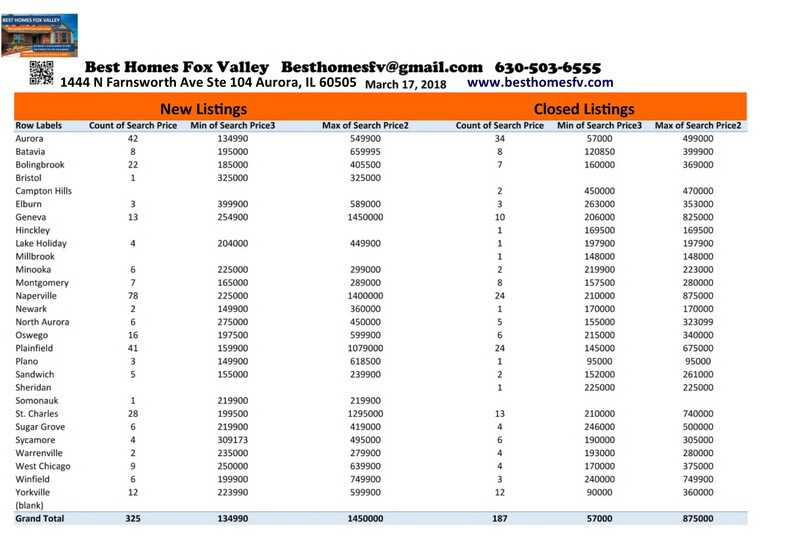 Check back with us every Saturday for the Market Update Fox Valley. You can contact us at 630-503-6555 Jeffery Szymczak-Broker ext 104, Bobby Burson-Broker ext 105 or Kristine Heiman,MCNE-Managing Broker ext 101. You can also fill out the contact form if you would like us to get back to you. Search for homes anytime whether you want to keep track of your neighborhood and how it is doing or looking to purchase. We can give you recommendations of lenders we have successfully worked with so you can get pre-approved. Down Payment Resource is a good place to go to see if you qualify for any help. Check out current interest rates to see where they are at right now. Our goal is to negotiate the price and terms that are best. We make it our business to find the perfect fit for your needs.